The prophet Isaiah foretold a time when wolves and lambs will dwell in peace. This certainly refers to the second coming of Jesus when all will be united under the Lordship of Jesus after he has put down his enemies and recognized the reign of God over the heavens and the earth. In the meantime, the disciples must wait for opposition and persecution from those who against the gospel. Jesus never hesitated to tell his disciples what they might expect if they followed him. Here Jesus says to his disciples: This is my task for you at its grimmest and horrible; do you accept it? This is not the world's way of offering a job. This is not the message we prefer to hear when the Lord Jesus commissions us in his service. However, our privilege is to follow in the footsteps of the Master who laid down his life for us. Are we willing to accept hardship and suffering in following after the Lord? 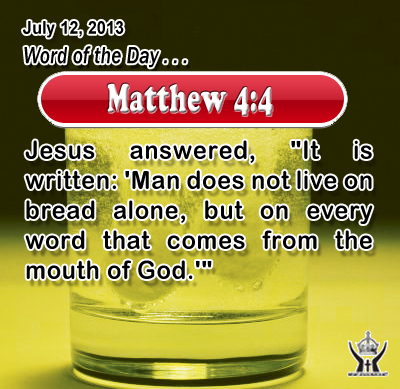 Matthew 4:4 Jesus answered, "It is written: 'Man does not live on bread alone, but on every word that comes from the mouth of God. Heavenly Father and Faithful God, through your Holy Spirit create in us a hunger for your Word that is much more necessary for our life than our hunger for food. We confess that at times we have been distracted by the ordinary things of life and have not sought your Word and have not nourished our soul as fully as we could. Please forgive us as we re-commit ourselves to be more attentive to your leading and your truth through your Word and by your Spirit. In the name Infant Jesus Christ we pray. Amen. 16"Behold, I send you out as sheep in the midst of wolves; so be wise as serpents and innocent as doves. 17 Beware of men; for they will deliver you up to councils, and flog you in their synagogues, 18 and you will be dragged before governors and kings for my sake, to bear testimony before them and the Gentiles. 19 When they deliver you up, do not be anxious how you are to speak or what you are to say; for what you are to say will be given to you in that hour; 20 for it is not you who speak, but the Spirit of your Father speaking through you. 21 Brother will deliver up brother to death, and the father his child, and children will rise against parents and have them put to death; 22 and you will be hated by all for my name's sake. But he who endures to the end will be saved. 23 When they persecute you in one town, flee to the next; for truly, I say to you, you will not have gone through all the towns of Israel, before the Son of man comes.